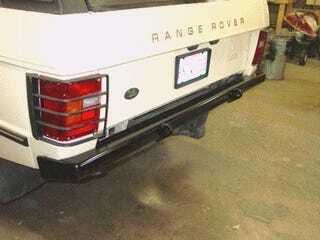 Photo isn’t mine, but I found a set of these rear lamp guards during a recent junkyard pillage. These were a factory Land Rover option and to find them today is quite rare. I picked them up on half off day for $6! Obviously I couldn’t leave there without them, but they’re a little rusty and could use some sanding and paint. I’m trying to decide if I like the astethic or if I should put them up on eBay. What does oppo think?